The Karen Youth Organization (KYO) has kicked off its summer youth camp on April 23 after changing the venue in response to the objection from the Mon State Minister of Security and Border Affairs. The KYO originally planned to hold the summer youth camp at Kwi Lay Village in the KNU Brigade 1 area in Bilin Township, Mon State but it was changed to Thay Bay Hta base in the KNU’s Hpa-an District under the Karen State, according to the KYO’s campaign and information officer Saw Eh Kaw. “We, youths, are not trying to destroy the country. We want youths to become intimate and work together for the country’s development.” he told Karen News. Over 60 Karen, Burmese, Intha, Kayan, and Rakhine youths from across the country such as Karenni (Kayah), Shan, Mon, and Rakhine states and Ayeyarwady, Tanintharyi, Bago, and Sagaing regions and the border area are attending the summer youth camp from April 23 to May 26. 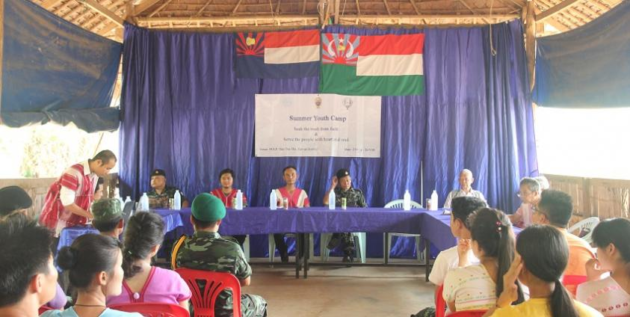 The Joint Monitoring Committee (JMC) and ten trainers from the border area will teach basic politics, federalism, constitution, the KNU’s directive and procedure, the current peace process, security of social communities, basic physical education, and leadership and management skills during the youth camp. The Mon State Minister of Security and Border Affairs sent a letter of objection to the KNU Brigade 1 liaison office on April 18 to state that the youth camp cannot be held in the Mon State without permission from the National Reconciliation and Peace Center (NRPC) and the JMC and unwanted problems may be created by holding the youth camp. “The government can object if it wants to. It should not drag the JMC along. It seemed as if the JMC was objecting [to the youth camp]. The JMC didn’t receive the letter of objection from the NRPC. We need to address this issue during our monthly meeting. [The issue] should be handled delicately without any deviations in the ceasefire period,” said Maj Saw Kyaw Myint, secretary 1 of the Mon State JMC. Karen youths from the KYO, the Karen Women’s Organization (KWO), and Karen Students Network Group (KSNG) are participating in this year’s summer youth camp. Other ethnic youths besides Karen youths are also attending the summer youth camp compared to previous years. Although the KYO started holding the summer youth camp in 2009, it was unable to hold it every year due to various situations. This is the fourth time the KYO is holding the summer youth camp.